The popularity of netbooks seem to be exploding over on the PC side of the computer world, but for Mac users, every laptop Apple ships comes with a DVD Superdrive, which both reads and writes to the optical discs. All, that is, save the MacBook Air. And while I don’t have an Air for use in this review, I believe performance will be the same on that machine. The first question you have to ask yourself is, if you already own a DVD burner in your Mac (and chances are you do) do you need an external USB model? 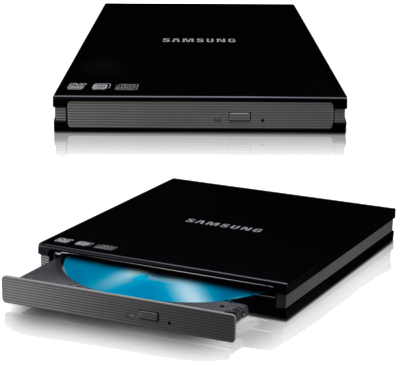 If so, then the Super WriteMaster Slim External DVD Writer from Samsung is a good choice. It is, as the name implies, very slim. It is also very light-weight, attractive to look at, and works well. It handled both expensive blank DVDs and the el-cheapo media equally well. It does not sport it’s own power supply, but draws power via the USB plug. So if you are running your laptop via the battery, this external DVD burner will kill your battery life in no time flat. I did notice that this drive demands a lot of power. On more than one occasion while testing the unit, the Mac simply did not have enough juice to power both this drive an other USB-powered devises at the same time. So if you have an external USB-powered hard drive on the same computer when you try and use this DVD burner, you may want to unplug the HD first. While the DVD writer worked great, my one gripe is the price. I think $75 is simply too expensive for what you get here. If it were 2002, I could probably justify the price. But when the calendar says it is almost 2010, an external DVD drive should not cost this much. Especially when you consider the biggest demographic buyer of this product is a netbook owner who probably didn’t pay more than $400 for their new tiny PC. Still, the ability to read and write DVD data discs is great if you don’t already have that capability in your current computer. But iDVD users should take note: it does not work with that software. Both Windows and Macintosh compatible. I bought the Samsung SE-S084C. Worked great with my Mac for 5 months. Then it wouldn’t spin anymore. Took forever to get anyone at Samsung, even using their lousy instant chat. Finally, over the phone, was told to send to Total Tech Solutions in NJ, at my expense, of course. They had it several weeks. When it finally arrived, it still didn’t work. I’ve returned this item 3 times. Now I have to say TTS has been great about emailing me prepaid UPS labels, but I swear I think they put it on a shelf for a week, send it back to me and hope I’ll get tired of the game. Never buy Samsung again.